Come and discover some of the amazing creatures we share the Earth with! From jaguars to oysters, whales to kiwis and eagles to earthworms, this book introduces a vast array of intriguing creatures. 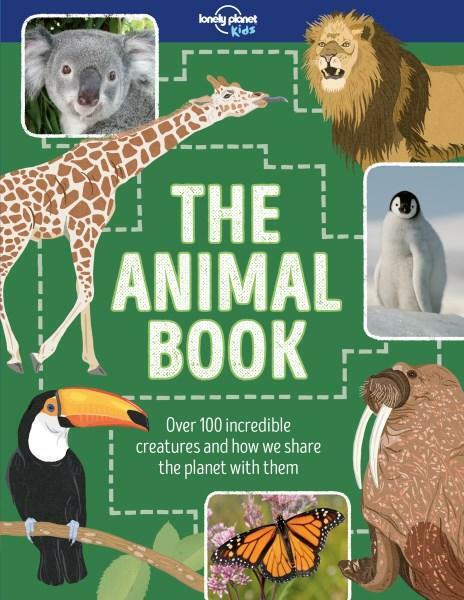 The Animal Book from Lonely Planet Kids profiles over 100 animals with fantastic photographic images and illustrations. The book has a section for each continent as well as one for ocean creatures, enabling kids to explore the appearance and habitats of all sorts of creatures, as well as find out about their secrets and cheeky antics! Would you like to learn how dung beetles help scientists track rare mammals on the savannah? Or marvel at the colours of the panther chameleon? Or perhaps you would like to know why a toucan has such a large beak, or how many times per second a hummingbird beats its wings? Then you had better start reading and not get distracted by how big a goliath bird-eating spider is (or the fact that people like to eat them). Each page in the book profiles a single creature, with a short summary paragraph at the top and a key facts box at the bottom, containing information such as scientific name, size, diet and status (eg extinct). A range of facts are then scattered around each page, along with photos and illustrations of the creature. Conservation messages are also interspersed throughout, noting efforts underway for endangered animals and drawing attention to the need to support protection and breeding programs for some of these wonderful creatures. The book is well laid out with good use of colour and colour blocks for breaking up text as well as clever positioning of images to support facts and snippets of information. This is a great resource book presented in a fun and interesting way. I went out and bought a copy for an eight-year-old’s birthday a couple of weeks ago (I didn’t want to give up my copy) and she has been enthusiastically reading a different creature profile every night since!